Christmas of 1993 would be another memorable moment, as I got the Super Nintendo Entertainment System as a gift. Granted, the system was released in 1991, my parents didn’t feel the need to purchase one till now. As usual, it was my report card that determined my fate. Make all A’s and I would get the version with Super Mario World and two controllers (Ha ha! A system that comes with two controllers, officially). Get A’s and B’s, I would get the version with one controller and no game. Well, that darn science class made me get a C+ so I was getting the no fun version. 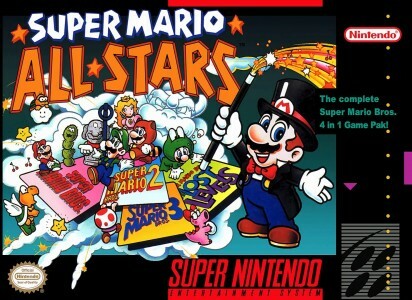 At the time however, Super Mario All-Stars was released, and to get the word out the game came included with the SNES Control Set. Today this game would be known as an HD remastered collection done right. Seeing the original three games with SNES features made the games fun to play again. It was also when I would learn that Super Mario Bros: The Lost Levels is the real Super Mario Bros. 2 via my first Nintendo Power I bought (Issue #52). The biggest feature was the ability to save the game anytime so I can play the games through instead of warping to the end. This game amazed all my friends and their parents at how the updated graphics and sound made the games feel fresh again. Now imagine if they did that with the Wii U?